Schools are still segregated. While school segregation as a result of the desire for racial separation is unconstitutional, segregation in American schools remains a fact. Segregation today is the result of larger institutional discrimination and social forces such as poverty, redlining, income inequality, and cultural isolation. In addition to racially segregated student populations, this reality manifests itself in major differences both in resources and educational outcomes. Regardless of the cause, segregation remains an abhorrent reality in the United States public school system. Further, it is rapidly increasing. 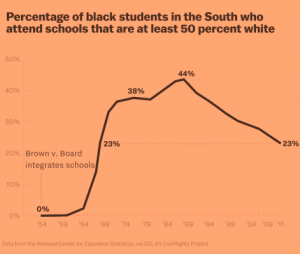 Schools are exponentially more segregated than they were thirty years ago. What is happening in Baltimore? School segregation in Baltimore is extreme. Baltimore’s neighborhoods are exceptionally segregated. Residential segregation, in turn, has clear effects on the city’s public school system. Schools are sharply divided based on race, with corresponding sharp divisions in economic resources and educational outcomes. Clear-cut lines can be drawn between affluent, white neighborhoods, with excellent educational facilities and opportunities, and poor, black neighborhoods, with dilapidated facilities, dated textbooks, and understaffed departments. The circumstances are bleak. However, while Baltimore is a principal example of educational resegregation at its worst, Baltimore is also at the heart of race-focused grassroots organizing. In this dire situation, the strong and united voices of Baltimore’s communities are beginning to be heard.